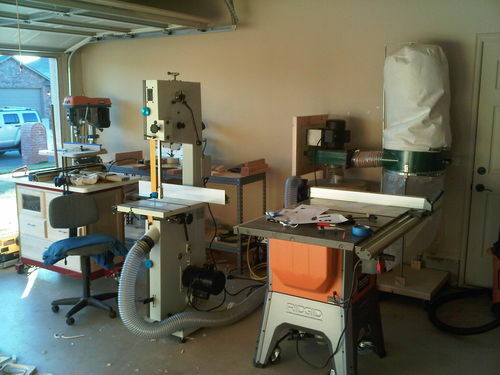 I bought this machine to replace a Delta 14” bandsaw equipped with riser blocks. That no longer could produce the power I needed. Lets get the the bad news done frist. Yes, this saw is made in China…...Don’t let that scare you. Yes, this saw cost a lot….But, you get what you pay for. Set up was easy. All I had to do was, mount the table, and the motar. The hardest part of the job was getting it off the palet it came on. Installing the motar was tricky, only because i was by myself. If I had a second pair of hands it would have been no problem. While assembling I could not help but notice the rugged construction of this beast. It is a SOLID machine. After a week of sitting idle in my shop. I finally received my blades from timber wolf, and upgraded my electric to 220 volt. The frist test was with a 1” 3tpi blade and a 12” tall pice of bubinga…..I was amazed. It cut with almost no hesitation, and vibration. The pieces were consistant and nearly finish quality. I made several other test with other blades, and all created great results. But, what impressed me the most. Was how easily it re sawed through 12” of bubinga. There are some draw back to the machine. but none are worth scoring it less than five stars. The bottom blade guides are a little tricky to work with. This could be a real problem if you change blades frequently. The table height of this machine seams to be a greatly debated issue. Personally I find the 36” height to be very nice. It allows you to have the same perspective as with a table saw. After working with it a while now, I find myself loving it. All and all I could not be happer with my purchase. As with any new machine I had to tweak a thing or two, here and there. But I think that is just par for the course. Nothing is ever perfect. I bought this from my local woodcraft store. Kudoos to them for a great experience. Can you elaborate on the lower guides? Looking at pics on the internets, they dont appear more of a headache than the little wing-nutty screws and blocks on my jet. I’m glad your happy with your new saw and I hope you enjoy it for years to come .Please excuses me posting my thoughts about my laguna saw. I have had a 16” Laguna band saw for a number of years, I think it has some features that are good but I think for a saw that was 30% more than it’s competitors it should have had had better finish and engineering in areas like table height and lacking things like a quick blade release and my saw was not made in China. After posting several negative things about Laguna’s customer service and my dissatisfaction with many aspects of their saw , I have had Laguna contact me about replacing my table top (because of it’s poor finish) and offering other options as far as my dissatisfaction with their saw . I was pleased that they finally made those offers. WOW…Jim I cant believe your saw does not have a quick release…..? I was told by the sales person it did have a quick release at the time of purchase once I received it of course I could see it didn’t have one when I called Laguna back and asked if they could ship a quick release to me they said they didn’t make that for my saw nor had the ever. this is one of the issues I talked to Laguna’s rep about when he contacted me.last year. I believe ether the sales person really needed a sale that week or just didn’t know what he was talking about. To be fair laguna’s rep made some offers to try and make things right. What scares me about “made in China” is not only a degradation of quality but a part of the tens of millions of outsourced jobs that have left the American economy. I too own the 14” SUV, i’ve had it for about 3 months now and I highly recommend the Laguna Re-Saw KING!! You think it’s fast with a timberwolf, try the Re-Saw King! Nice saw Lance…..I love mine too. I have heard nothing but good things about the re-saw king. Except…..That it duels rather quickly…and at $216 a pop its very pricy. My timber wolf blades last for a while and their only $35 each. Just food for thought, I could buy 6 of the timber wolfs for one of the re-saw kings. However, in the future if i need to cut some really thin veneers I will get a re-saw king. Woolymonster, I share your concern. But, its so hard to find things made in America these days. I could not help but notice that you bought a bandsaw made in Taiwan also? I am curious where your heard the Resaw King dulls quickly, it will outlast a carbon blade 10-1 easy and a silicon steel blade like the TW even more so, plus they are less than $50 to get sharpened. I have Lenox Woodmaster CT and Trimaster carbide tipped blades also and they all last roughly the same amount of time, the silicon steel or carbon blades will be initially sharper though due to the limitations of carbide. This doesn’t even address the fact the carbide blades will produce a better finish since the teeth have no set. Hey Huxley, I think I may have heard on this site, that the re/saw king dulls quickly. This is the frist bandsaw I have personally owned that would be worthy of a CT blade. So I really dont know jack about them. For now I am just playing it safe. Also, its really not in my budget to spend that much. Like I said I have heard nothing but rave reviews about their performance. But for now ill stick with the steel blades. I just recently re/sawed a pice of quilted maple 2”/12”/6’ into -1/8” slices, and the timberwolf preformed great. Although I killed the blade with that one task. Sure I might have gotten an extra slice had i used a CT blade. But for $35 bucks who can complain about that? I am glad to hear that they last so long. Does That apply to cutting hard woods such as Bubinga, Purple heart, and Maple? xylophage: Yes, I did break down and buy a Taiwanese saw. Have regretted it so far and may be returning it for a refund. What are my options? I guess I will outsource my hard earned cash to Italy next (Laguna). At least I think that it will be a quality product that will live up to its advertising claims. I can’t say enough good things about mine, and it was made in china. I have used the larger italian made lagunas, and there great machines. This is one area that laguna is top of its class. @Wollymonster to make a good leap in quality I think you have 5 choices over the PM1800. 1. Large old cast iron US made saw, there are plenty of old Yates, Northfield, Moak, Oliver etc saws WELL under what you paid for the PM1800 you can even get plug and play dealer saws for significantly less. There are also a lot of Italian bandsaws for sale used as well. 2. The Europeans, the three Italians; Agazzani, Minimax and Laguna and the Austrian saws (Felder). Of the four the Minimax are the heaviest built but each has their advantages. Agazzani, Centauro(builds the MM) and ACM (builds the Laguna) are all within a stones throw of each other in Northern Italy. ACM used to build the Felder saws but they have gone inhouse now. I just happened on this review and I had some questions about the SUV. From my reading of another review, this is the noisiest of the 14 inch bandsaws. Did you find noise to be an issue? I would be interested in hearing if you hired someone to put in 220V – there is no way I would ever mess with electricity so I was wondering what it would cost to wire 220V for the garage if you have an idea. Finally, I notices from the picture that you have a fixed base – I thought these sold with built in mobile base that you hook a rod to to drag around the shop – did you just remove the wheels?